What makes a hero with nothing to lose? What can he or she do to gain victory or at least escaping with their lives intact? Okay, that might sound a little confusing but what is the perfect scenario for your hero to gain absolute victory? A. A great defensive stand against an impossible force out numbered 10 to 1? B. Defeating a foe whose power is 10x’s greater than the hero? C. Giving up ones life for others to be save regardless of the ultimate outcome? Just questions in developing the beginnings of your principal character to your story. 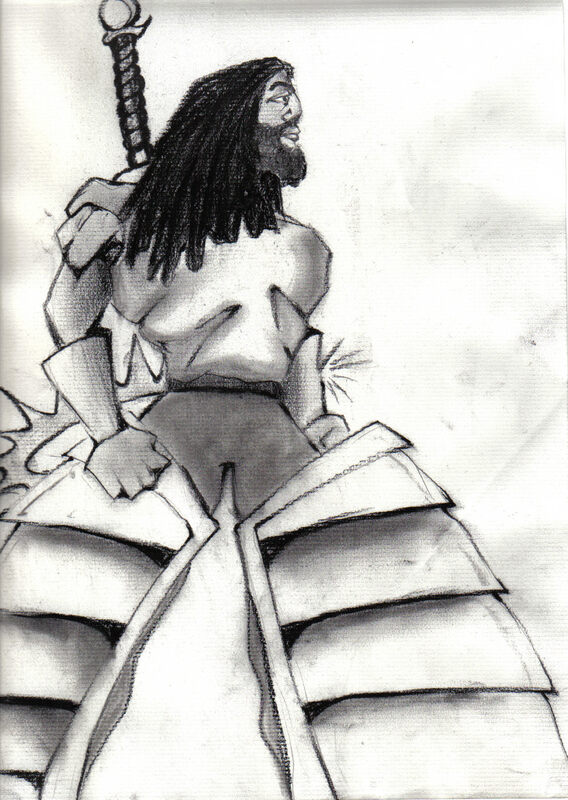 Above picture copyrighted Avenging Knights “Rebirth of Lost Honor” Kevin Ray of St. Louis artist. Niiice dude! I’ll have to go with answer ‘C’, the willingness to lay down one’s life to save everyone else’s, well, that’s just a classic hero-quality! yeah it is ken. too bad poet couldn’t do that from the comfort of his personal desk barking orders to his crew. Hey, thanks for stopping by and “liking” part VI of my story! At this point, I’d have to go with “D”, depending on the point of the story – you really have to get into the hero’s head and figure out why he or she is doing what he or she is doing. Find their reason, and there you go. I’ve started reading some of your poetry and I have to say I like it. Thanks again for stopping by! Best of luck to us both! Hello KG. Thanks for visiting my blog. I’m a sucker for any of the heroic stands above, too much reading sword and sorcery and science fiction plus comics. When I putter with writing or play an RPG my heroes tend to be the outcasts who realize there is a “greater good” to fight for and figure it’s better for them to bear the brunt rather than “innocents”. cool, thanks for the thought out response. i’m a sucker for those as well! A friend recommended The Power of Myth to me. It’s a series about Joseph Campbell’s life’s work, which is looking at myths in our culture. The first episode is about the Hero’s Journey. You can probably find it on youtube. St. Louis! I used to live in Cahokia, IL until 2005 when I moved to the Dothan, AL area. Do you still have much snow in the StL area? A friend in Troy, MO said it’s bad there. Thanks for stopping by and liking my posts.